When you think about receiving bath gift sets for Christmas it conjures up memories of being gifted Lavemder scented sets or Lynx is always a go-to set for teenage boys. They inevitably end up at the back of your bathroom cabinet or a shelf in a charity shop in January. Does anyone ever use the body crème or bath salts that come in the gift sets we get? How many body puffs do you actually need? I think I'm right in saying most of us would prefer one really good quality gift over a 3 for 2 Boots deal, some chocolate and some slippers. You can ditch the gift sets with a lip gloss and flannel that nobody ever uses and pick one top notch gift this Christmas which will earn you a wide smile from whoever your cherished recipient is. You could opt for one big gift like a robe which will be soft and warm to wrap up in when you leave the bath or a radio with batteries so it can be cable free in the bathroom. 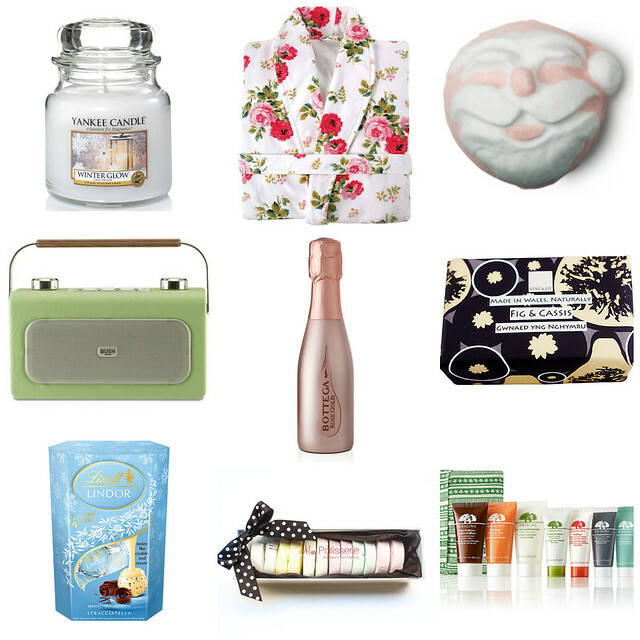 You could even make your own hamper filled with all of the recipients favourite things. I'm going to be doing this for my brother this year (Sorry if you're reading this Geraint. Surprise!) and pick and mix from all of their favourite brands. Wilko sell small baskets and the clear wrap to cover them and tie up with a bow. Voila, perfect present. If a gift is bespoke or well thought out you know won’t get forgotten about or even worse – re-gifted! Yankee Candle, Warm Glow - A crisp scent of frosted leaves on snow-covered trees in the cool air, all warmed by golden amber sun rays. Doesn't it sound divine? A perfect what to create a relaxing bath environment. Cath Kidston floral robe - Perfect to slip on when you applying your post bath body butter. If you're going to have a properly luxurious bath a glass of fizz is essential, this mini bottle is perfect for one. Cole & Co Fig and Cassis Soap - I had to include something Welsh, I do go on about Wales aaaall the time. This soap is handmade on the island of Anglesey and with a fruity and woody scent is perfect for both the guys and girls in your life. Lindt chocolate - Lidlt chocolate is my all time favourite, I want this gift myself. Someone run me a bath right now, pop a bath bomb in and leave these chocolates on the side! This Bath Pastille set from Miss Patisserie is great for your Vegan and animal loving friends as it is completely cruelty free but also paraben free. If you're going all out and aiming to impress the Origins Superstars Mini set is ideal. They fit in an overnight toiletries bag or a handbag and are a good way to see what products suit you before buying the full sized ones. i like your share so much!i hope you can post more! That robe looks so cosy! I agree with the above person; champagne and a bath. However I did break my bone close to the elbow after having a glass of wine and slipped whilst getting out of the tub. Oh the pain! But if you're careful, it's so lovely to sit in a bath with candles and champagne.